3-D STEEL BULLET PLUGS WITH BLACK "O" RINGS. EACH PLUG IS GROOVED FOR THE "O" RING TO BE A PERFECT FIT.TOP QUALITY 316L SURGICAL STEEL. 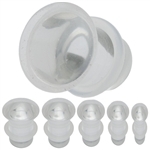 each sold individually ACRYLIC INTERNAL SCREW ON TUNNELS IN 8G,6G,4G,2G,0G,00G OR 1/2".THE SEAMLESS FIT OF THE INTERNALLY THREADED TECHNOLOGY MAKES THESE SCREW ON TUNNELS LOOK PERFECTLY SMOOTH AND VERY COMFORTABLE TO WEAR.INTERNALLY THREADED TUNNELS ARE VERY POPULAR.JUST SCREW OFF ONE SIDE AND PLACE IN YOUR EAR AND SCREW BACK ON,VERY EASY AND FAST. 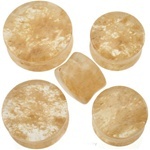 SYNTHETIC AMBER SADDLE PLUG.THESE PLUGS ARE SADDLED FOR A COMFORTABLE FIT AND NO "O" RINGS ARE NEEDED. Color and pattern may vary due to the nature of the stone. each sold individually BLACK ARENG WOOD SADDLE PLUGS.THESE PLUGS ARE HAND CARVED ON THE ISLAND OF BALI,INDONESIA.TOP QUALITY 100% NATURAL ORGANIC BLACK ARENG WOOD. 100% genuine semi-precious stones are all natural and will vary in color and pattern. 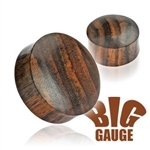 each sold individually (order 2 for a pair) BLACK ARENG WOOD ORGANIC SQUARE PLUGS. TOP QUALITY HANDMADE ON THE BEAUTIFUL ISLAND OF BALI,INDONESIA.100% ORGANIC ALL NATURAL WOOD HAND CARVED. 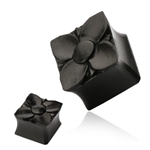 BLACK ARENG WOOD SQUARE SOLID PLUGS FROM 2G UP TO 1" INCH! BLACK ARENG WOOD ORGANIC TRIANGLE PLUGS. TOP QUALITY HANDMADE ON THE BEAUTIFUL ISLAND OF BALI,INDONESIA.100% ORGANIC ALL NATURAL WOOD HAND CARVED. BLACK ARENG WOOD TRIANGLE SOLID PLUGS FROM 2G UP TO 1" INCH! BLACK WATER BUFFALO HORN TUNNELS IN 6G,4G,2G,0G,00G,7/16",1/2",9/16",5/8" & 3/4".THESE TUNNELS ARE ALL HAND CARVED ON THE ISLAND OF BALI,INDONESIA AND ARE 100% GUARANTEED ORGANIC BLACK WATER BUFFALO HORN. - 100% genuine semi-precious stones are all natural and will vary in color and pattern. BLACK ONYX STONE EYELETS IN 8G THROUGH 1.25 INCH. TOP QUALITY 100% ORGANIC GENUINE STONE EYELETS. each sold individually Black Titanium Prong Set CZ Plug. PRONG SET CLEAR C.Z. PLUGS. THESE PLUGS ARE CRAFTED WITH 316L SURGICAL STEEL AND AAA PERFECT QUALITY DIAMOND LIKE CUBIC ZIRCONIA GEMS.EACH PLUG COMES WITH A BLACK "O" RING ON IT. 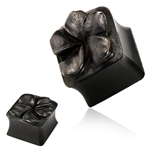 AVAILABLE IN BLACK TITANIUM ANODIZED TOP QUALITY 316L SURGICAL STEEL. BLACK TITANIUM ANODIZED ALL STEEL CZ RIMMED HOLLOW SADDLE EAR PLUGS. Made of top quality TITANIUM ANODIZED 316L Surgical Stainless Steel and top quality sparkling Cubic Zirconia. 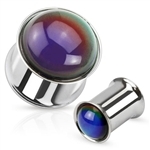 TITANIUM ANODIZED BLINKING PLUGS.COMES IN TITANIUM ANODIZED COLORS INCLUDING PINK,RED,BLUE,PURPLE AND BLACK.COMES IN 1/2",9/16" & 5/8".SIMPLY TWIST THE PLUG ON AND IT STARTS BLINKING AND SIMPLY LOOSEN THE PLUG A LITTLE AND IT STOPS,VERY EASY TO USE AND VERY COMFORTABLE. BLONDE CROCODILE WOOD ORGANIC SQUARE TUNNELS TOP QUALITY HANDMADE ON THE BEAUTIFUL ISLAND OF BALI,INDONESIA.100% ORGANIC ALL NATURAL WOOD HAND CARVED. BLUE CRAZY AGATE STONE PLUGS IN 8G,6G,4G,2G,0G,00G & 1/2" (3.2MM,4MM,5MM,6MM,8MM,10MM,12MM).BLUE CRAZY AGATE IS A VERY RARE AND BEAUTIFUL NATURAL STONE.TOP QUALITY,SMOOTH HIGH POLISHED. 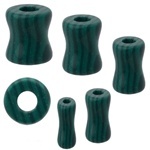 each sold individually BLUE CHRYSOCOLLA STONE PLUGS IN 8G,6G,4G,2G,0G,00G & 1/2" INCH .THESE ARE 100% ORGANIC NATURAL STONE PLUGS HAND CARVED.TOP QUALITY. BLUE CHRYSOCOLLA STONE IS VERY BEAUTIFUL AND VERY RARE IT HAS A VERY OCEAN BLUE FEEL TO IT! BROWN SONO WOOD SINGLE FLARE TUNNELS. HANDMADE ON THE BEAUTIFUL ISLAND OF BALI,INDONESIA.100% ORGANIC HANDMADE PLUGS,EXCELLENT UNSURPASSED QUALITY! PLAIN STEEL 1 SIDE FLAT BULLET PLUGS WITH BLACK "O" RINGS. EACH PLUG IS GROOVED FOR THE "O" RING TO BE A PERFECT FIT.TOP QUALITY 316L SURGICAL STEEL. CARNELIAN STONE SADDLE PLUGS IN 5/8",11/16",3/4",7/8" & 1" (16MM,18MM,19MM,22MM,25MM).CARNELIAN STONE IS KNOWN BY MANY TO HELP OVERCOME ANGER AND CREATE SELF CONTROL,IT IS ALSO KNOWN TO CALM YOUR TEMPER.THESE PLUGS ARE 100% GENUINE STONE. CHECKERED BLONDE CROCODILE AND BLACK ARENG WOOD SADDLE PLUGS.THESE PLUGS ARE HAND CARVED ON THE ISLAND OF BALI,INDONESIA.TOP QUALITY 100% NATURAL ORGANIC BLONDE CROCODILE AND BLACK ARENG WOODS. BLONDE CROCADILE WOOD WITH BLACK ARENG WOOD SECTIONAL TUNNELS.THESE PLUGS ARE HAND CARVED ON THE ISLAND OF BALI,INDONESIA.TOP QUALITY 100% NATURAL ORGANIC BLONDE CROCODILE AND BLACK ARENG WOODS. BLONDE CROCODILE WOOD PLUGS. 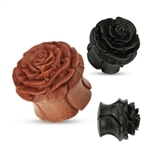 THESE WOOD PLUGS ARE HAND CARVED ON THE ISLAND OF BALI,INDONESIA.TOP QUALITY PERFECT QUALITY. each sold individually BLONDE CROCODILE WOOD ORGANIC SQUARE TUNNELS.TOP QUALITY HANDMADE ON THE BEAUTIFUL ISLAND OF BALI,INDONESIA.100% ORGANIC ALL NATURAL WOOD HAND CARVED. BLONDE CROCODILE WOOD ORGANIC Triangle PLUGS.TOP QUALITY HANDMADE ON THE BEAUTIFUL ISLAND OF BALI,INDONESIA.100% ORGANIC ALL NATURAL WOOD HAND CARVED. each sold individually (order 2 for a pair) BLONDE CROCODILE WOOD ORGANIC Triangle TUNNELS.TOP QUALITY HANDMADE ON THE BEAUTIFUL ISLAND OF BALI,INDONESIA.100% ORGANIC ALL NATURAL WOOD HAND CARVED. each sold individually (order 2 for a pair) CROCODILE WOOD TUNNELS. HANDMADE ON THE BEAUTIFUL ISLAND OF BALI,INDONESIA.100% ORGANIC HANDMADE TUNNELS,EXCELLENT UNSURPASSED QUALITY! C.Z. SCREW ON TUNNELS. CLEAR C.Z. 'S ARE SET ALL AROUND THE EDGE OF THESE SCREW ON TUNNELS.TOP QUALITY 316L SURGICAL STEEL. ALL STEEL CZ RIMMED HOLLOW SADDLE EAR PLUGS. Made of top quality 316L Surgical Stainless Steel and top quality sparkling Cubic Zirconia. DALMATION JASPER STONE SADDLE PLUGS IN 8G,6G,4G,2G,0G,00G & 1/2" (3.2MM,4MM,5MM,6MM,8MM,10MM,12MM)DALMATION JASPER IS A VERY RARE AND BEAUTIFUL NATURAL STONE.TOP QUALITY,SMOOTH HIGH POLISHED. DOUBLE FLARE C.Z. 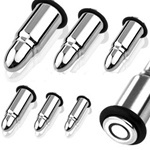 316L SURGICAL STEEL BARRELL STYLE PLUGS IN 8G,6G,4G,2G,0G .TOP QUALITY 316L SURGICAL STEEL. each sold individually (order 2 for a pair) DOUBLE FLARE EARLETS.TOP QUALITY 316L SURGICAL STEEL. DOUBLE FLARE TUNNELS.TOP QUALITY 316L SURGICAL STEEL. THESE ARE VERY SIMILAR THE THE DOUBLE FLARE EARLETS BUT HAVE A THICKER STEEL AREA AND SMALLER HOLE. EARSKIN FLEXIBLE EYELETS.COMES IN BLACK,BLUE. YELLOW AND PINK COLORS.THESE ARE VERY LIGHTWEIGHT THIN SILICONE TUNNELS,VERY COMFORTABLE,ALMOST LIKE SKIN! 50 PAIRS OF EARSKIN FLEXIBLE EYELETS IN ASSORTED SIZES FROM 6g - 9/16 INCH.COMES IN BLACK,BLUE. YELLOW AND PINK COLORS.THESE ARE VERY LIGHTWEIGHT THIN SILICONE TUNNELS,VERY COMFORTABLE,ALMOST LIKE SKIN! FACET CUT PURE CRYSTAL PLUGS IN PINK,RED,CLEAR,DARK EMERALD GREEN,JET BLACK,AQUA BLUE,PURPLE AND AMBER TOPAZ.COMES IN GAUGES INCLUDING 6G,4G,2G,0G,00G,1/2",9/16" & 5/8" (4MM,5MM,6MM,8MM,10MM,12MM,14MM,16MM).TOP QUALITY FACET CUT PURE CRSTYAL SADDLE PLUGS. each sold individually (order 2 for a pair) FAIRY CAMEO DOUBLE FLARE PLUGS.COMES IN 00G,1/2",9/16",5/8",3/4" (10MM,12MM,14MM,16MM,19MM).TOP QUALITY 316L SURGICAL STEEL DOUBLE FLARE TUNNEL WITH FAIRY CAMEO.TOP QUALITY 316L SURGICAL STEEL DOUBLE FLARE TUNNEL WITH FAIRY CAMEO. - Fire Topaz gives a rich, brown color with a warm-tone. EACH PLUG IS GROOVED FOR THE "O" RING TO BE A PERFECT FIT.TOP QUALITY 316L SURGICAL STEEL. CLEAR FLOATING U.V. DICE PLUGS.COMES IN ALL CLEAR PLUGS WITH WHITE DICE,BLACK DICE,RED DICE,LIGHT BLUE DICE,ROYAL BLUE DICE,FLOURESCENT GREEN DICE,PINK DICE OR PURPLE DICE.THESE DICE PLUGS ARE SADDLED FOR A VERY COMFORTABLE FIT WITH NO NEED FOR ANY "O" RINGS.AMAZE EVERYONE WHEN WEARING THESE "MAGICAL" FLOATING DICE IN YOUR EARS! 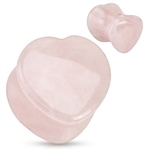 SILICONE FLEXI-TUNNELS IN GIANT SIZES RANGING .THESE PLUGS ARE SOFT AND SQUISHY AND FLEXIBLE,THEY ARE VERY COMFORTABLE TO WEAR,A LOT OF PEOPLE LOVE TO WEAR THESE SILICONE FLEXI TUNNELS. 316L SURGICAL STEEL SCREW ON FLESH TUNNELS. TOP QUALITY! EXTREME SIZED BLACK HORN/WHITE BONE STRIPED ORGANIC PLUGS from 1 to 2 inches. BLACK BUFFALO HORN WITH WHITE BONE STRIPE ORGANIC PLUGS .THESE PLUGS ARE HAND CARVED ON THE ISLAND OF BALI,INDONESIA. SINGLE FLARE 316L SURGICAL STEEL TUNNELS WITH BLACK "O" RINGS ON THEM. TOP QUALITY 316L SURGICAL STEEL. BROWN SONO WOOD SADDLE PLUG.THESE PLUGS ARE HAND CARVED ON THE ISLAND OF BALI,INDONESIA.THEY ARE TOP QUALITY ,PERFECT IN QUALITY 100% NATURAL ORGANIC SONO WOOD. each sold individually (order 2 for a pair) GLOW IN THE DARK PLUGS IN GREEN GLOW,WHITE GLOW,PURPLE GLOW,PINK GLOW AND BLUE GLOW IN THE DARK COLORS.COMES IN 14G,12G,10G,8G,6G,4G,2G,0G & 00G .EACH PLUG COMES WITH 2 BLACK "O" RINGS ON IT AND THE PLUGS ARE GROOVED FOR THAT PERFECT "O" RING FIT. GOLD PLATED 316L SURGICAL STEEL DOUBLE FLARE TUNNELS IN 14G,12G,10G,8G,6G,4G,2G,0G,00G & 7/16"
14K GOLD PLATED SCREW ON TUNNELS,CHOOSE YOUR GAUGE BELOW.TOP QUALITY 316L SURGICAL STEEL 14K GOLD PLATED. each sold individually HEMATITE STONE PLUGS. HEMATITE STONE IS A 100% NATURAL STONE,IT IS A DARK GREY SLATE COLOR.THE SADDLE DESIGN MAKES THEM VERY COMFORTABLE TO WEAR. BLACK BUFFALO HORN WITH WHITE BONE STRIPE ORGANIC PLUGS .THESE PLUGS ARE HAND CARVED ON THE ISLAND OF BALI,INDONESIA. YELLOW JACKFRUIT WOOD PLUGS HANDMADE ON THE BEAUTIFUL ISLAND OF BALI,INDONESIA.100% ORGANIC HANDMADE PLUGS,EXCELLENT UNSURPASSED QUALITY! each sold individually YELLOW JACKFRUIT WOOD PLUGS HANDMADE ON THE BEAUTIFUL ISLAND OF BALI,INDONESIA.100% ORGANIC HANDMADE PLUGS,EXCELLENT UNSURPASSED QUALITY! 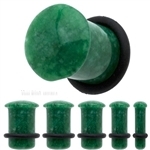 GREEN JADE AVENTURINE STONE SADDLE PLUGS.GREEN JADE AVENTURINE STONE IS SAID TO BRING GOOD LUCK AND MONEY TO THOSE WHOM WEAR IT.100% NATURAL STONE HAND CARVED. 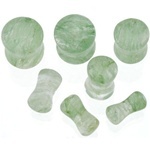 JADE ADVENTURINE STONE HOLLOW EYELETS IN 9/16 THROUGH 1.25 INCH TOP QUALITY 100% ORGANIC GENUINE STONE,VERY COOL! The iridescence is the result of light refracting within perthitic lamellar intergrowths. Each piece will have a varying degree of iridescence or play of colors. U.V. 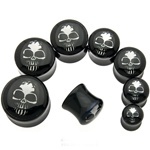 ACRYLIC PLUGS WITH 2 "O "RINGS . each sold individually GREEN MALACHITE TEAR DROP STONE PLUGS IN 8G,6G,4G,2G,0G,00G & 1/2" INCH (3.2MM,4MM,5MM,6MM,8MM,10MM,12MM).THESE ARE 100% ORGANIC STONE HAND CARVED. MARBLE SWIRL U.V. 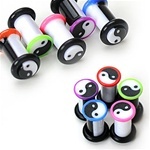 PLUGS WITH 2 BLACK "O" RINGS IN BLACK,DARK BLUE,PINK,PURPLE,FLOURESCENT GREEN,RED,WHITE AND LIGHT BLUE U.V. 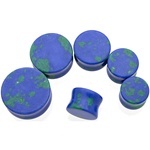 REACTIVE COLORS.THESE PLUGS ARE TOP QUALITY AND ARE GROOVED SO THAT THE "O" RINGS STAY PERFECTLY IN PLACE.COMES IN 12G,10G,8G,6G,4G,2G & 0G. BLACK AND WHITE POLISHED MARBLE STONE PLUGS IN 8G,6G,4G,2G,0G,00G,1/2",9/16" (3.2MM,4MM,5MM,6MM,8MM,10MM,12MM,14MM).EACH PLUG COMES WITH CLEAR "O" RINGS ON IT. 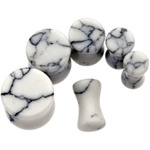 THESE POLISHED MARBLE STONE PLUGS ARE VERY COOL ,THEY ARE SWIRLED WITH WHITE AND BLACK STONE WITH CLEAR "O" RINGS. ALL CLEAR METALLIC GLITTER ENCASED PLUGS IN 8G,6G,4G,2G,0G OR 00G.COMES IN ASSORTED COLORS INCLUDING METALLIC ROYAL BLUE,FIRE OPAL LIGHT BLUE,METALLIC GOLD,METALLIC PURPLE,METALLIC SILVER,METALLIC COPPER ORANGE AND METALLIC PINK IRRIDESCENT .THESE PLUGS ARE CLEAR WITH THE GLITTER ENCASED INSIDE THE THE PLUG FOR AN INCREDIBLE LOOK.COMES WITH CLEAR "O" RINGS. each sold individually MIDNIGHT BLACK GOLDSTONE SADDLE PLUGS. 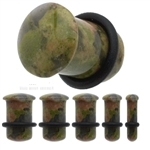 THESE PLUGS ARE SOME OF THE BEST LOOKING PLUGS YOU WILL HAVE EVER SEEN! THE COLOR IS A MIDNIGHT DARK BLACK WITH SPARKLING GOLD SPECKS THAT LOOK LIKE THE STARS IN THE SKY AT MIDNIGHT.THE BLACK STONE HAS A VERY SLIGHT PURPLE TINT TO IT,WHICH MAKES THEM LOOK INCREDIBLE. Sold individually (order 2 for a pair) MOSS AGATE STONE SADDLE PLUGS IN 8G,6G,4G,2G,0G,00G & 1/2" (3.2MM,4MM,5MM,6MM,8MM,10MM,12MM). 100% ORGANIC NATURAL POLISHED STONE. each sold individually MULTI STAR BLACK HORN WITH WHITE BONE INLAY STAR TUNNELS.COMES IN 2G,0G,00G,7/16",1/2",9/16",5/8" OR 3/4" (6MM,8MM,10MM,11MM,12MM,14MM,16MM,19MM).EACH PLUG IS HAND CARVED BY SKILLED ARTISTS ON THE ISLAND OF BALI INDONESIA. each sold individually NEON PLUGS WITH 2 "O "RINGS . PLUGS ARE TOP QUALITY AND HAVE HAND CARVED GROOVES FOR THE "O"RINGS TO FIT SNUG ON THEM FOR EXTRA COMFORT AND TO KEEP THEM IN PLACE. UNBEATABLE QUALITY. OBSIDIAN STONE PLUG. SNOWFLAKE OBSIDIAN STONE NATURAL SADDLE PLUG. THE SADDLE DESIGN MAKES THEM VERY COMFORTABLE TO WEAR. 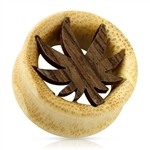 AVAILABLE IN 8G, 6G, 4G, 2G, 0G, 00G, 1/2", 9/16", 3/4", 7/8" OR 1"
PALM WOOD SOLID PLUG. 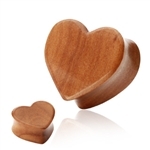 THESE PALM WOOD PLUGS ARE HAND CARVED ON THE ISLAND OF BALI ,INDONESIA AND ARE 100% ORGANIC NATURAL WOOD. PALM WOOD HOLLOW TUNNELS. THESE PALM WOOD TUNNELS ARE HAND CARVED ON THE ISLAND OF BALI ,INDONESIA AND ARE 100% ORGANIC NATURAL WOOD. Perfect for starting a plug inventory in your store or getting a great deal on plugs for yourself. Choose a single size from 6g - 1/2 inch, a mix of small sizes from 14g-1/2 inch or a mix of all sizes from 14G all the way up to 1.25 inches. PRONG SET BLACK C.Z. PLUGS. THESE PLUGS ARE CRAFTED WITH 316L SURGICAL STEEL AND AAA PERFECT QUALITY BLACK DIAMOND LIKE CUBIC ZIRCONIA GEMS.EACH PLUG COMES WITH A BLACK "O" RING ON IT. AVAILABLE IN TOP QUALITY 316L SURGICAL STEEL. PRONG SET CLEAR C.Z. PLUGS. THESE PLUGS ARE CRAFTED WITH 316L SURGICAL STEEL AND AAA PERFECT QUALITY DIAMOND LIKE CUBIC ZIRCONIA GEMS.EACH PLUG COMES WITH A BLACK "O" RING ON IT. AVAILABLE IN TOP QUALITY 316L SURGICAL STEEL. 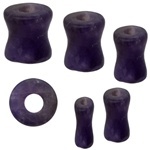 each sold individually Purple Agate Mosaic Plug. PURPLE CRAZY AGATE STONE PLUGS IN 8G,6G,4G,2G,0G,00G & 1/2" (3.2MM,4MM,5MM,6MM,8MM,10MM,12MM).PURPLE CRAZY AGATE IS A VERY RARE AND BEAUTIFUL NATURAL STONE.TOP QUALITY,SMOOTH HIGH POLISHED. PURPLE CRAZY AGATE TEAR DROP SHAPE CARVED STONE PLUGS.TEAR DROPS CAN BE WORN JUST LIKE ROUND SHAPED PLUGS BY ANYONE WITH STRETCHED EARS,THEY ARE JUST MORE UNIQUE AND COOL LOOKING THAN A REGULAR ROUND PLUG.COMES IN 8G,6G,4G,2G,0G,00G & 1/2" (3.2MM,4MM,5MM,6MM,8MM,10MM,12MM).THESE ARE 100% ORGANIC NATURAL GEM STONES! - Rhodonite is a very popular stone for all jewelry designs. Its unique inclusions give itself a mysterious look! 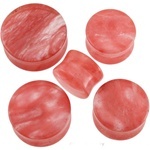 - 100% genuine semi-precious stones are all natural and will vary in color and ROSE CAMEO DOUBLE FLARE PLUGS.COMES IN 00G,1/2",9/16",5/8",3/4" (10MM,12MM,14MM,16MM,19MM).COMES IN ASSORTED COLOR CAMEOS INCLUDING WHITE,PURPLE,RED,PINK.TOP QUALITY 316L SURGICAL STEEL DOUBLE FLARE TUNNEL WITH Rose CAMEO. Sold individually (order 2 for a pair) ROSE QUARTZ STONE SADDLE PLUGS.ROSE QUARTZ IS KNOWN BY MANY AS THE "LOVE STONE",IT IS A STRONG HEALER OF BROKEN HEARTS,A FRIENDSHIP GIFT,A FERTILITY CRYSTAL AND ENCOURAGES SELF LOVE.100% NATURAL STONE,HAND CARVED. each sold individually SABA WOOD PLUGS HANDMADE ON THE BEAUTIFUL ISLAND OF BALI,INDONESIA.100% ORGANIC HANDMADE PLUGS,EXCELLENT UNSURPASSED QUALITY! RED SABA WOOD TUNNELS. HANDMADE ON THE BEAUTIFUL ISLAND OF BALI,INDONESIA.100% ORGANIC HANDMADE TUNNELS,EXCELLENT UNSURPASSED QUALITY! - Soft white snow jade is a precious and it is relatively hard to find. SNOW WHITE QUARTZ STONE HOLLOW EYELETS IN 8G, THROUGH 1.25 INCH TOP QUALITY 100% ORGANIC GENUINE STONE PURE WHITE,VERY COOL! 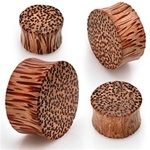 please note that these plugs have a very large flare which may make them difficult to insert SPOTTED PALM WOOD WITH BLONDE CROCODILE WOOD HOLLOW TUNNELS IN 2G,0G,00G,7/16",1/2",9/16",5/8",3/4",7/8" OR 1" INCH (6MM,8MM,10MM,11MM,12MM,14MM,16MM,19MM,22MM,25MM) .THESE TUNNELS ARE HAND CARVED IN BALI,INDONESIA.100% ORGANIC. due to the square shape, reviewers have found it more comfortable to order a size smaller than would normally be worn. 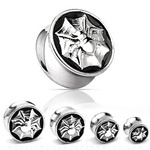 STAR SCREW ON FLESH TUNNELS.TOP QUALITY 316L SURGICAL STEEL ,SCREW ON FOR THE PERFECT COMFORTABLE FIT. 100% ORGANIC BLONDE CROCADILE WOOD WITH BLACK BUFFALO HORN STAR PLUGS IN 14 SIZES! TOP QUALITY HAND CARVED ON THE BEAUTIFUL ISLAND OF BALI,INDONESIA BY SKILLED ARTISANS. each sold individually EXOTIC TRI-COLOR STRIPED WOOD PLUGS THEY ARE A COMBINATION OF GOLDEN JACKFRUIT/COCNUT SPOTTED WOOD/BLACK ARENG WOOD ALL IN 1 PLUG.EACH PIECE IS HAND CARVED THEN JOINED TOGETHER INTO ONE PLUG WITH PERFECT CRAFTSMENSHIP,THESE ARE AMAZING! COMES IN 2G,0G,00G,7/16",1/2",9/16",5/8",3/4",7/8",1",1 1/4" (6MMM,8MM,10MM,11MM,12MM,14MM,16MM,19MM,22MM,25MM,31MM). GIANT GAUGE SUPER GLITTER U.V. REACTIVE SADDLE PLUGS.BY "SUPER GLITTER" WE MEAN THAT THERE IS ALOT OF GLITTER MIXED IN WITH THE U.V. MATERIAL MAKING IT EXTRA SPARKLY,UNLIKE ANY GLITTER PRODUCT YOU MAY HAVE EVER SEEN.TOP QUALITY U.V. REACTIVE. 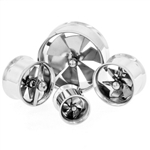 each sold individually SUPER SIZED HIGH POLISHED ACRYLIC SADDLE PLUGS 13 SIZES IN ALL RANGING FROM 1 INCH UP TO 2 INCHES! 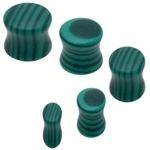 COMES IN BLUE,PINK,BLACK,WHITE,PURPLE AND GREEN.TOP QUALITY HIGH POLISHED SMOOTH FINISH,SADDLE PLUGS ARE VERY COMFORTABLE TO WEAR AND LAST FOREVER! SUPER-SIZED HIGH POLISHED ACRYLIC TUNNELS COMES IN 13 SIZES INCLUDING 26MM,28MM,30MM,32MM,34MM,36MM,38MM,40MM,42MM,44MM,46MM,48MM,50MM.COMES IN BLACK,GREEN,PURPLE,WHITE,BLUE AND PINK.TOP QUALITY HIGH POLISHED ACRYLIC WILL LAST A LIFETIME! SUPER SIZE BLACK TITANIUM ANODIZED SCREW ON TUNNELS,CHOOSE YOUR GAUGE BELOW.TOP QUALITY 316L SURGICAL STEEL BLACK TITANIUM ANODIZED. SUPER SIZE BLACK TITANIUM ANODIZED DOUBLE FLARE TUNNELS,CHOOSE YOUR GAUGE BELOW.TOP QUALITY 316L SURGICAL STEEL BLACK TITANIUM ANODIZED. BLACK TITANIUM ANODIZED SUPER SIZE SINGLE FLARE TUNNELS,EACH COMES WITH A BLACK "O" RING AND IS GROOVED FOR A PERFECT FIT.TOP QUALITY 316L SURGICAL STEEL BLACK TITANIUM ANODIZED. SUPER GIANT GAUGE 14K GOLD PLATED SCREW ON TUNNELS,CHOOSE YOUR GAUGE BELOW.TOP QUALITY 316L SURGICAL STEEL 14K GOLD PLATED. SUPER SIZED 14K GOLD PLATED SINGLE FLARE TUNNELS,CHOOSE YOUR GAUGE BELOW.EACH PIECE COMES WITH A BLACK "O" RING ON IT FOR ADDED COMFORT,AND THEY ARE GROOVED FOR A PERFECT FIT ON THE "O" RING.TOP QUALITY 316L SURGICAL STEEL 14K GOLD PLATED. each sold individually SUPER SIZE DOUBLE FLARE PLAIN STEEL TUNNELS,CHOOSE YOUR GAUGE BELOW.TOP QUALITY 316L SURGICAL STEEL. YELLOW TIGER'S EYE STONE HOLLOW TUNNELS IN.THESE TUNNELS ARE HAND CARVED AND POLISHED. 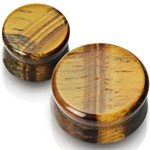 YELLOW TIGER'S EYE STONE PLUGS.THESE TUNNELS ARE HAND CARVED AND POLISHED. 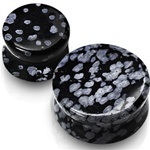 ROSE TITANIUM ANODIZED BLACK ACRYLIC PLUGS.COMES IN RED,DARK BLUE,AQUA BLUE,PINK,GOLD & SILVER ROSES. COMES IN GAUGES INCLUDING 6G,4G,2G,0G & 00G (4MM,5MM,6MM,8MM,10MM).TOP QUALITY HIGH SHINE BLACK ACRYLIC WITH TITANIUM ANODIZED METAL ROSE. - Tree Agate gives a beautiful natural layered shade within. TRI-COLOR 100% ORGANIC WOOD PLUGS.THESE PLUGS ARE HAND CARVED ON THE ISLAND OF BALI,INDONESIA. RED SABA WOOD,BLACK ARENG WOOD AND GOLDEN JACKFRUIT WOOD CENTER! TRIANGLE EARSKIN FLEXIBLE EYELETS.COMES IN BLACK,BLUE. YELLOW AND PINK COLORS.THESE ARE VERY LIGHTWEIGHT THIN SILICONE TUNNELS,VERY COMFORTABLE,ALMOST LIKE SKIN! BLACK HIGH SHINE ACRYLIC TRIANGLE TUNNELS IN 2G,0G,00G,9/16",5/8",3/4",7/8" & 1" (6MM,8MM,10MM,14MM,16MM,19MM,22MM,25MM).THESE TRIANGLE SHAPED BLACK ACRYLIC TUNNELS ARE VERY POPULAR THEY ARE GOING TO GET ALOT OF ATTENTION! ANYONE WITH REGULAR STRETCHED EARS CAN WEAR TRIANGULAR SHAPED TUNNELS. each sold individually TURQUOISE STONE SADDLE PLUGS. 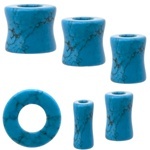 TURQUOISE STONE IS BELIEVED BY MANY TO BRING COURAGE,PROTECTION,LOVE AND FRIENDSHIP TO THOSE WHOM WEAR IT.THESE PLUGS ARE TOP QUALITY 100% NATURAL STONE,HAND CARVED. 100% GENUINE TURQUOISE STONE SINGLE FLARE PLUGS IN 8G,6G,4G,2G,0G,00G & 1/2" INCH.EACH SINGLE FLARE COMES WITH A CLEAR "O" RING ON IT.TOP QUALITY HAND CARVED,HIGH POLISHED GENUINE STONE PLUGS. each sold individually U.V. PLUGS WITH 2 "O "RINGS . PLUGS ARE TOP QUALITY AND HAVE HAND CARVED GROOVES FOR THE "O"RINGS TO FIT SNUG ON THEM FOR EXTRA COMFORT AND TO KEEP THEM IN PLACE. UNBEATABLE QUALITY. U.V. PLUGS WITH 2 "O "RINGS . PLUGS ARE TOP QUALITY AND HAVE HAND CARVED GROOVES FOR THE "O"RINGS TO FIT SNUG ON THEM FOR EXTRA COMFORT AND TO KEEP THEM IN PLACE. UNBEATABLE QUALITY. 14-0G U.V. SADDLE PLUGS IN 6G,4G,2G,0G OR 00G.COMES IN CLEAR,PINK,DARK BLUE,RED,FLOURESCENT GREEN,PURPLE AND WHITE.TOP QUALITY HIGH SHINE ACRYLIC,U.V. 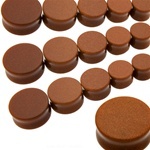 REACTIVE.THESE PLUGS ARE SADDLED FOR A COMFORTABLE FIT AND NO "O" RINGS ARE NEEDED. WHITE BONE SOLID PLUGS IN 8G,6G,4G,2G,0G,---9/16",5/8" & 3/4" (3MM,4MM,5MM,6MM,8MM,14MM,16MM,19MM) NOTE :THE BONES OF WATER BUFFALO DO NOT GROW IN SIZES TO BE ABLE TO CARVE OUT THE SIZES ABOVE 0 GAUGE AND BELOW 9/16".THESE ARE 100% NATURAL SO WE HAVE TO WORK WITH WHATEVER SIZE BONES THE BUFFALO GROWS IN. ***NO BAD EFFECTS ON THE EARS,EASY TO CLEAN,LASTS FOREVER IT'S BONE! WHITE BONE HAND CARVED PLUGS WITH BLACK WATER BUFFALO HORN STAR INLAY.THESE PLUGS ARE HAND CARVED ON THE ISLAND OF BALI,INDONESIA. THESE PURE WHITE BONE PLUGS ARE HAND CARVED OF REAL BONES FROM WATER BUFFALO,THEN INLAID WITH BLACK WATER BUFFALO HORN. THESE ARE ACTUALLY BONES THAT HAVE BEEN HOLLOWED OUT IN THE MIDDLE BY HAND CARVING! 100% GENUINE WATER BUFFALO WHITE BONE TUNNELS. HAND CARVED ON THE ISLAND OF BALI,INDONESIA. WHITE PYRITE QUARTZ STONE SADDLE PLUGS IN 8G,6G,4G,2G,0G,00G & 1/2" INCH (3.2MM,4MM,5MM,6MM,8MM,10MM,12MM).TOP QUALITY 100% ORGANIC NATURAL GENUINE STONE. EACH PLUG COMES WITH 1 BLACK "O" RING ON IT AND THE PLUGS ARE GROOVED FOR THAT PERFECT "O" RING FIT.